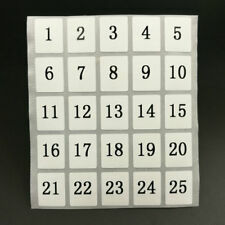 400 Number Stickers 1 To 100 Waterproof Black Letters White Sticker 0.62"x0.51"
Quantity: 400 small stickers. ( 4 sets " 1 to 100 ", 4 x 100 = 400 stickers). Color: silver sticker with black letters, see the photo. Item: number Label Stickers 1 To 100. Size : 13mm x 16mm (0.51" x 0.62" ). 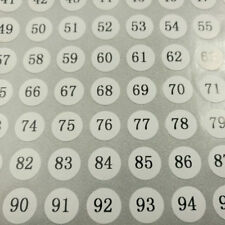 400 Number Stickers 1 To 100 Black Letters Round & White Sticker 0.39"
Quantity: 400 small stickers. ( 4 sets " 1 to 100 ", 4 x 100 = 400 stickers). 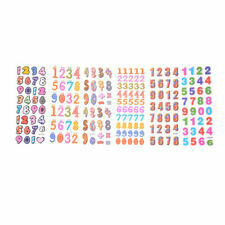 Item: number Label Stickers 1 To 100. - And do not worried too much if your parcel is on the normal sending way your parcel is on the normal sending way! New Arrival Wax Seal Design Sticker Lots. They are very like a real wax seal label. 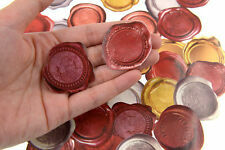 They are not real Wax seal material. Size : 13mm x 16mm (0.51" x 0.62" ). Quantity: 130 small stickers. ( 5 sets " A to Z ",5 x 26= 130 stickers). Color: silver sticker with black letters, see the photo. 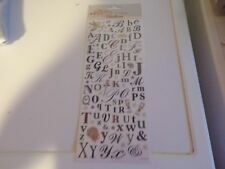 Item: Alphabet Label Stickers A To Z. 500PCS/Roll Thank You Stickers Mini DIY Craft 1 inch Heart-Shaped White Gift Lables Wedding Favours Decorative Sealing Stickers Specifications: White Heart-Shaped 500 adhesive labels, each roll has 500 labels. Size: label diameter - about 1inch/2.5cm Material: high-quality kraft paper, with clear print and stiff feel. With reel design, our labels are easier to store. Style: Black alphabet White heart Decorate Thank you cards: to increase fun to Thank you cards, to show your appreciation to your family, customers or suppliers. Perfect DIY Gift Decor: Use the labels to seal food packaging such as cake, pastry, biscuit, Maccaron, chocolate and so on. Perfect for wedding, anniversary, gift or birthday thank you envelopes. Quantity: 260 small stickers. 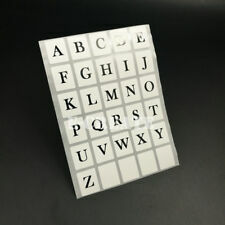 ( 10 sets " A to Z ", 10x 26 = 260 stickers). Size : 10mm x 10mm (0.39" x 0.39" ). Color: see the photo. Item: Label Stickers A to Z. Hot 500 Thank You Stickers Mini DIY Craft 1" Silver Round Lables Wedding Favour Specifications: Gold Round 500 adhesive labels,, each roll has 500 labels. Size: label diameter - 1 inches/2.5cm Material: high-quality paper, with clear print and stiff feel. With reel design, our labels are easier to store. Decorate Thank you cards: to increase fun to Thank you cards, to show your appreciation to your family, customers or suppliers. Perfect DIY Gift Decor: Use the labels to seal food packaging such as cake, pastry, biscuit, Maccaron, chocolate and so on. Perfect for wedding, anniversary, gift or birthday thank you envelopes.Add a unique touch to special orders, gift boxes, restaurant receipts, party favors, bags and more. Package: 500pcs thank you stickers /roll. Color : Multi-colors. Quantity : 1 Pc. Content : 9sheets/set. patterns : 3PVC 6 paper. Size: 12 x 16 ( CM ). Size : 40mm x 20mm (1.57" x 0.78" ). Item: Consecutive Number Label 001 to 1000. Quantity: 1000 pcs in roll. Color: silver sticker with black letters, see the photo. These stickers will work great in any planner! We will reply you within 24 hours. Material:8 sheets PVC. Quantity: 800 small stickers. ( 4 sets " 1 to 200 ", 4 x 200 = 800 stickers). Item: number Label Stickers 1 to 200. Color: silver sticker with black letters, see the photo. Make it to stick at anywhere to make reminder. Due to the difference between different monitors, the picture may not reflect the actual color of the item. Quantity: 1 Pc. Add a unique touch to special orders, gift boxes, restaurant receipts, party favors, bags and more. Specifications: Gold Round 500 adhesive labels,, each roll has 500 labels. Material: high-quality paper, with clear print and stiff feel. 500PCS/Roll Thank You Stickers Seals Mini DIY Craft Heart-Shaped Lables Wedding Favours Specifications: Heart-Shaped 500 adhesive labels, each roll has 500 labels. Size: label diameter - 1 inches/2.5cm Material: high-quality kraft paper, with clear print and stiff feel. With reel design, our labels are easier to store. Decorate Thank you cards: to increase fun to Thank you cards, to show your appreciation to your family, customers or suppliers. Perfect DIY Gift Decor: Use the labels to seal food packaging such as cake, pastry, biscuit, Maccaron, chocolate and so on. Perfect for wedding, anniversary, gift or birthday thank you envelopes. Drawing Market calendar Card Scrapbooking Diary Decoration Sticker 6 sheet. Material:PVC transparent. Specifications: Gold Heart-Shaped 500 adhesive labels,, each roll has 500 labels. Material: high-quality kraft paper, with clear print and stiff feel. You may also like. Best Regards. 6 sheets cute stickers different patterns, so you white diary, more wonderful. Material: PVC Paper. High quality in EU and US quality standard. Note: Due to the difference between different monitors, the picture may not reflect the actual color of the item. I send it from the Netherlands. Material:8 sheets paper 4sheet pvc. We will reply you within 24 hours.